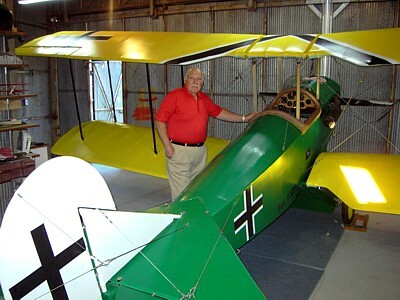 Doug Moler’s third annual ultralight fly-in, held at Highpoint ((3K55) October 30th, brought those birds out of the woodwork plus some of the “heavy iron”. It was even cause for a temporary truce between the Huns, the Brits & French. Note in the photos that a Hun and a Hun hunter are parked side by side. Actually it was part of the truce, that way our guns would not be aimed at each other and neither would take a sneaky shot! 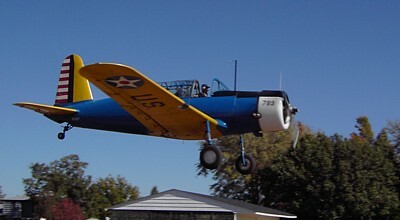 Small planes swarmed in from Cook Field (Hart’s Coyote II and Hilderbrand’s Sonnex), from Cherokee Strip (Girard’s Kolb, Geide’s Geide Hawk), Selby Aerodrome (Fiebich’s AirBike, FitzGerald’s Quicksilver), Miles Field (Curtis’ Fokker DR-I) plus an assortment of Pipers, Rans, Interstate, Cessna’s, Champ, Bonanza, several from the host airfield and a few others that escape my mind. About 18 airplanes in all joined the afternoon of food, friendship, constant flying and ride giving. Doug and wife Sabrina supplied the majority of food and refreshments with everyone bringing their speciality dishes such as home made chocolate chip cookies, pumpkin pie, cranberry cobbler, potato salads, etc. Bowls of Halloween candy were placed stragetically. Knowing I was near enemy territory I wanted to follow up on a hunch about a new Hun plane about to join the fray. With engine out and gliding silently, I landing softly on a Neil Wretberg’s sod strip and coasted to a stop near some pine trees. 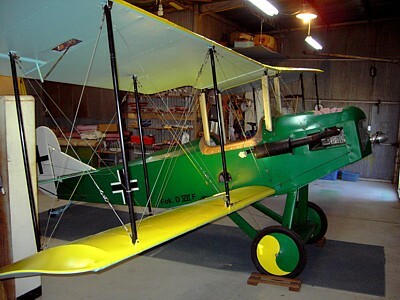 Sneaking into a hangar I spotted a brand new scale replica of a Fokker D VII. 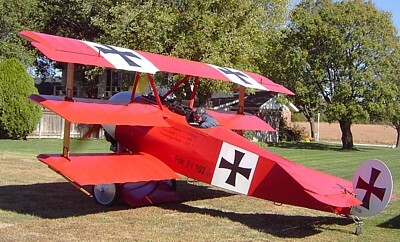 Attempting to frighten people away, Neil had positioned several cardboard cutout “scarecrows” of himself in the hangar next to the plane. I took several espionage photos then scrambled away. We may soon see more of this weapon in our gunsights! As the saying goes, “all had a good (actually GRAND) time”. The pilots had as much fun flying, giving rides and smoking up the place as did those ground-pounders who watched. These are the events we look forward to, enjoy while they are taking place, and exaggerate while reliving the memories via photos and subsequent hangar talk. I left Selby Aerodrome about 1:00 in the early afternoon and with a waiver from the Mid-Continent tower, flew through the airport’s Class C airspace while following the Big Ditch at an altitude of 400′ AGL. Over the tower frequency I heard them announce: “Watch for wake turbulence from AirBike flying the Big Ditch.” I think there was a bit of sarcasism is that voice! A smoking flyby at Highpoint announced my arrival and signaled more temporary IFR conditions to follow during the day’s activities. 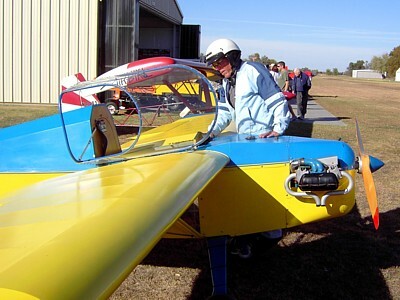 It wasn’t long before a later smoking solo performance by me was challenged by Doug Moler’s in his AirBike. Later we teamed up for multiple formation smoking fly-bys. Doug Moler wows the crowd with his smokin’ Airbike fly-by! At 6:15 PM I peeled out of our formation, circled the runway and made a mad dash for Selby Airdrome 30 miles away and 15 minutes prior to official sunset. Even at 65 MPH I didn’t make it but the sky was clear which provided an extra 15 minutes of civil twilight. Five minutes after landing, the lights went out, it was dark as the inside of a cow! 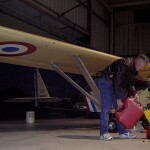 Carefully adding mixed oil/gas, Paul Fiebich refills his AirBike’s twin wing tanks. 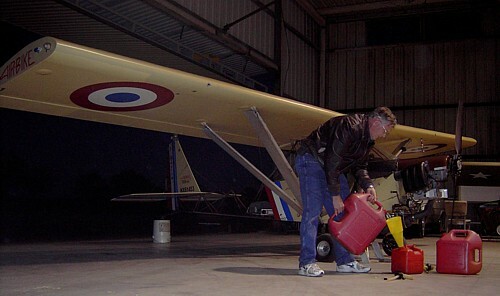 Refuled, wiped down, parked and covered, my AirBike was soon fast asleep in its bunker while the hot engine parts popped and creaked during its continued cool down. Hangar door shut, ceiling lights out, I walked the hangar’s length in darkness towards the entry door knowing by heart where the obstacles were. I particularly like the lighting of final shot. Did you stage that with a camera timer? Yes Brian, I placed the camera on a bucket, started the 10 second timer with flash then got into the frame. I am unsure if the flash helped as typically it only goes about 6 feet and the camera was about 20 feet away from the subject. I think the flash helped enormously but in a subtle manner. That is one of the things I liked about it. Also you benefit from the light overhead. For an otherwise mundane shot I was very impressed at the craft of it. Without the flash you would not have much of the underside of the wing. Also, the flash is bringing your jeans, shoes, face and gas cans into more prominence. 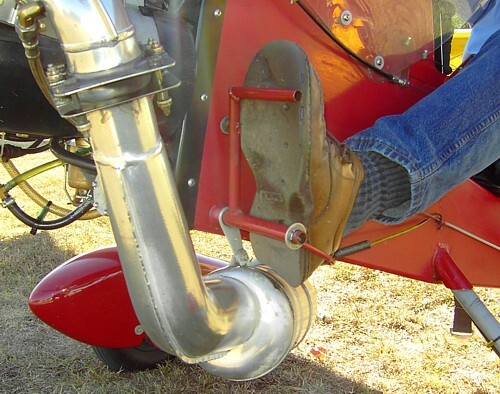 It even pulled the tailwheel bucket into view which provides increased depth to the shot. I am very impressed. Wow, thanks! Coming from a guy who does this professionally, your words mean a lot! 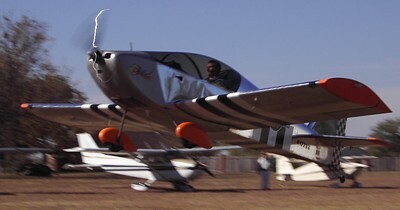 Ed Merkel was flying from the front cockpit of his Merkel Mark II Maverick. Greg Pavlish was in the rear. 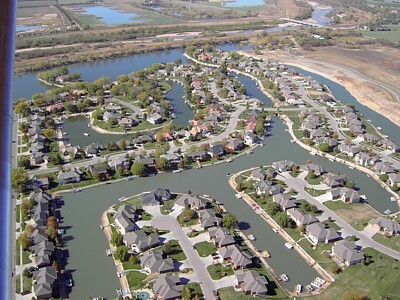 We moved into Valley Center, so High Point is still convenient to us for hangaring the airplane.